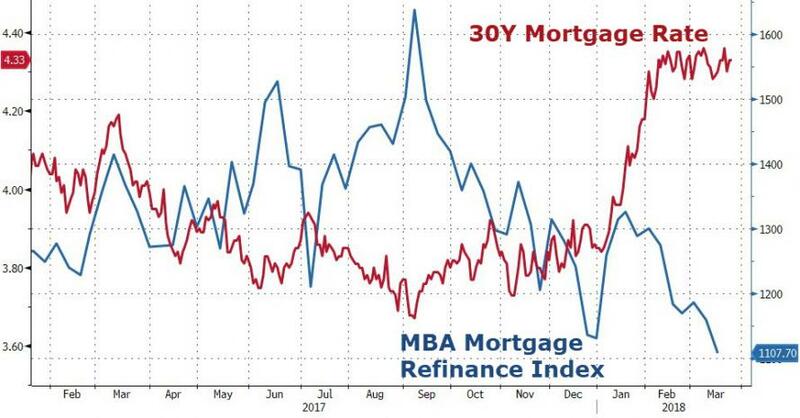 ... look no further than this recent chart from the January Mortgage Monitor slidepack by Black Knight: it shows the recent collapse of the refi market using the recent jump in 30Y and mortgage rates. As Black Knight writes, it looks at the – quite dramatic – effect the mortgage rate rise has had on the population of borrowers who could both likely qualify for and have interest rate incentive to refinance. 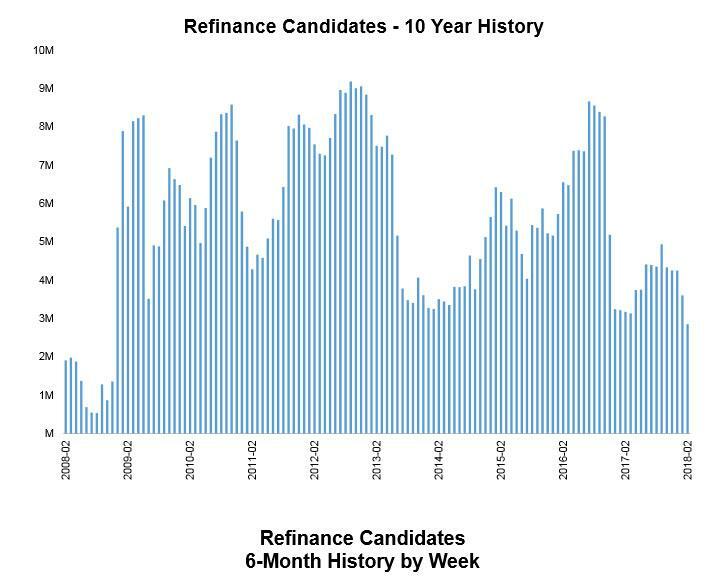 It finds that the number of potential refinance candidates has tumbled to the lowest since December 2008. Which is bad news not only for homeowners, but also for the banks, whose refi pipeline - a steady source of income and easy profit - is about to vaporize. Here are some more details from the WSJ: last year, 37% of mortgage-origination volume was because of refinancings, according to industry research group Inside Mortgage Finance. That is the smallest proportion since 1995, and the number of refinancings is widely expected to shrink again this year. In 2012, refinancings were 72% of originations. 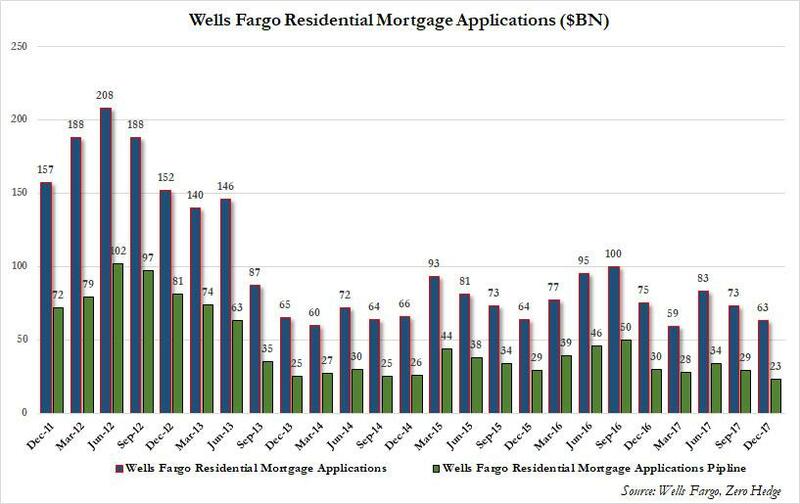 We demonstrated this plunge in bank mortgage financing last quarter when we showed the near record low mortgage application activity at America's largest traditional mortgage lender, Wells Fargo. Non-traditional lenders face even greater peril: Quicken Loans Inc. got about 70% of its mortgage-origination volume last year from refinancings, according to Inside Mortgage Finance—a higher proportion than any other large lender. 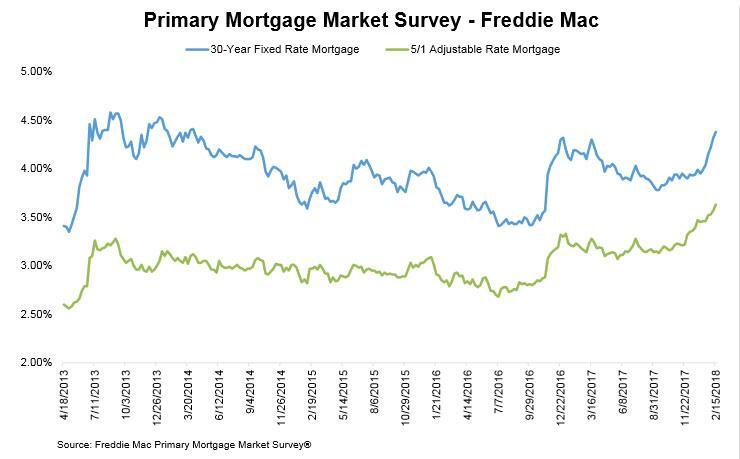 Of course, the higher rates rise, the more mortgage applications drop, suggesting that contrary to expectations for a rebound in interest expense as Net Interest Margin rises, bank will be far worse off as a result of rising rates as refi activity grinds to a crawl. Or, as the WSJ explains it, "increased mortgage rates can hamper refinancing activity because many homeowners have rates that are already lower than what lenders can now offer. In other cases, the higher rates cut into the savings a homeowner stands to reap by refinancing a mortgage." The Mortgage Bankers Association expects nothing short of a bloodbath: it forecasts overall mortgage-purchase volume to grow about 5% in 2018 but refinancing volume to drop 27%. Refinance applications fell 5% in the week ended March 16 from the prior one, according to the group. Here is another example of how higher rates are crushing - not helping - traditional banks: since around the beginning of 2017, Valley National Bancorp , based in Wayne, N.J., has transitioned its mortgage business to 40% refinancing from 90%, said Kevin Chittenden, who runs residential lending. The bank previously relied largely on attracting homeowners through its ads for low-cost refinancings, but has since engaged with outside sales reps who are focused on purchases. Guy Cecala, chief executive of Inside Mortgage Finance, said he expects some smaller nonbank lenders to sell themselves by the end of the year because of the drop in the refinancing market and mortgage originations overall. Unlike banks, nonbank lenders typically don’t rely on branches or ties to local agents, which are traditional tools for capturing mortgage purchases. Another risk: the return of subprime borrowers. As the WSJ adds, the waning of the refinancing boom also attracts a different type of homeowner than at the beginning. As mortgage rates go up, the average credit score of refinancings tends to go down, according to industry research. That is partly because savvy borrowers are the ones who tend to take advantage of low interest rates first. Also, some borrowers who are refinancing now are doing so to get rid of their mortgage insurance: Home prices in many parts of the country are going up, meaning some homeowners are less leveraged even if they have paid down only a small portion of their mortgage. As for "new" mortgage platforms such as Quicken Loans which face an imminent calamity as their refi platform implodes, Chief Executive Jay Farner said the company is still enjoying demand for both purchases and refinancings, including from homeowners whose decision to refinance is focused less on rates and more on consolidating debt or switching to a shorter-term loan. The biggest irony in all of the above, of course, is that there are still those who will claim that higher rates in the "new normal" are good for banks. For the far more unpleasant reality: see a chart of Wells Fargo stock.